September « 2012 « I'd rather be in France. Let’s get back to business, shall we? While it may appear that I have been gallivanting about all summer — taking a bar exam here, camping in the desert there — there have been some pretty exciting things going on behind the scenes. 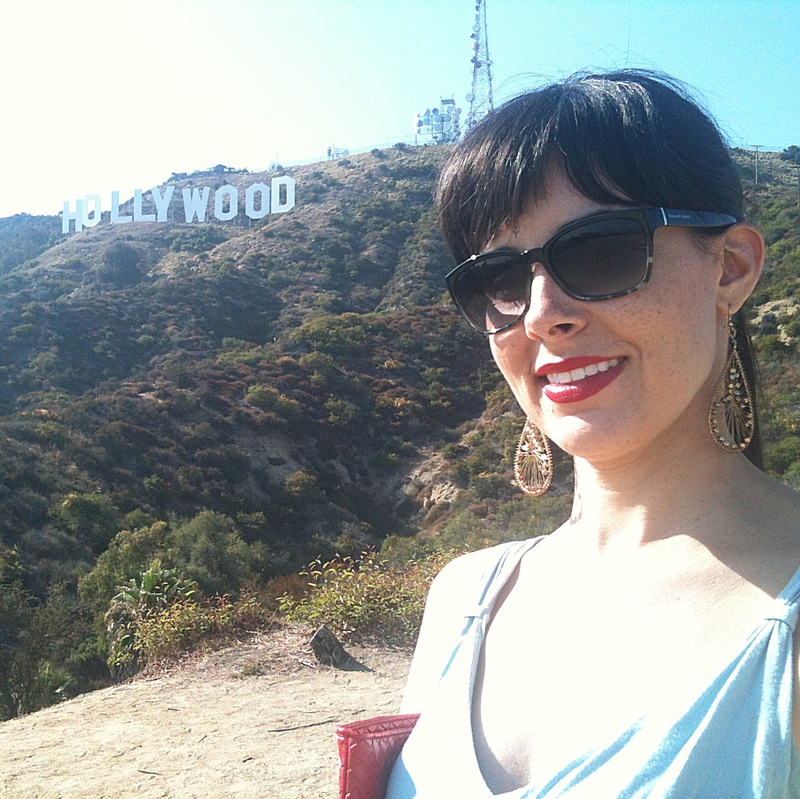 If you are familiar with my story, then you will know that I moved to California with the mindset of opening a bakery. The idea of starting my own business had been going strong for almost a year (I was actively learning French in preparation for opening a bed & breakfast in southwest France), and then working six months at Three Green Ducks bakery confirmed I want to be involved in food — something I had joked about doing since law school. I even picked a name and developed a logo for my bakery (neither of which have formally been announced, so I will save them for another day). Then the serious business planning began. Almost instantly, I realized how much better the experience would be if I had another person with whom I could share the inevitable emotional roller coaster and with whom I could share the responsibility of making smart business decisions. You’ve actually heard about him before. It was Arthur who suggested we meet for a cupcake at Three Green Ducks that fateful day last July, and it was Arthur who talked me into asking about the “help wanted” sign on the door. I think he thought he was just getting an inside connection to free baked treats at an amazing bakery only a few blocks from his apartment, but ultimately he got a regular napper on his sofa after my early-morning opening shifts and, eventually, a loft full of furniture between the time I moved out of my apartment and moved to California. Arthur and I first met at church. He attended the University of Tennessee for undergrad (boo! ), and I, of course, attended the University of Georgia. We were instant rivals with the deep connection of SEC sports. Arthur grew up in Memphis, Tennessee, so we also had sort of a cultural connection of being from the south and having a lot of shared southern values but also finding a natural fit in the diverse and fast-paced city environment. A little known fact is that Arthur actually went to law school for a year, but then changed paths and ended up in the finance sector. Although we do have a lot of things in common, our personalities are very different, and it was sort of an unlikely friendship. I can’t remember exactly how the idea of starting a business together was born. I think I’ll have to get him to write a guest blog to tell his side of the story and maybe fill in some of these holes. I do know it started off as a joke. Arthur had a fried chicken party in his little backyard every summer, and I started teasing him about moving to California and selling fried chicken. Around the time I moved out here (or perhaps because of it), Arthur started reevaluating what he was doing with his own life, and somehow came to the conclusion that he was also an entrepreneur at heart. Our initial conversations about starting a business together were purely hypothetical. If we did have a business, what would it be. 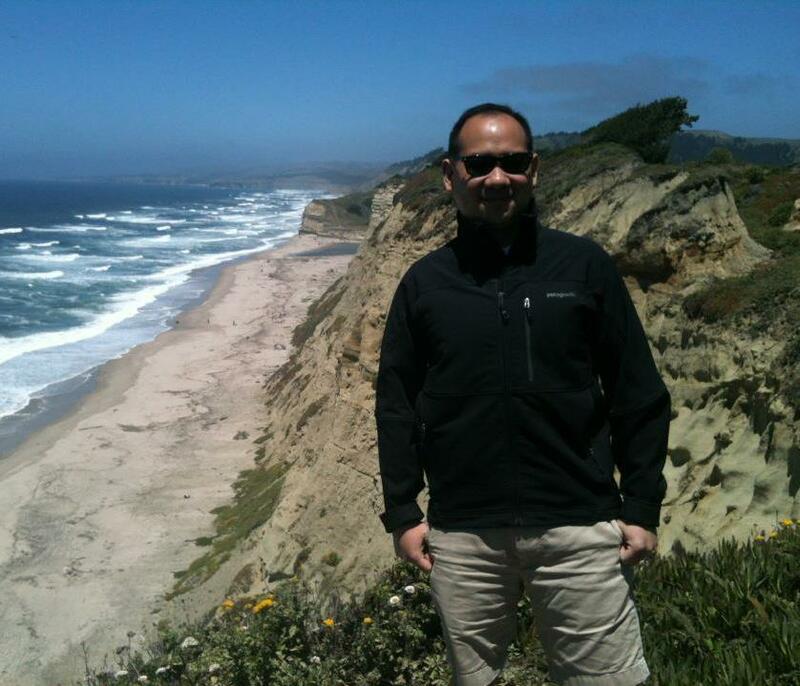 After a couple of months, the conversation shifted to, “Hey, maybe we really should do this.” Arthur, being the careful and calculated person he is, weighed his options and booked a trip to San Francisco and to visit me this past July. By the end of the trip, he was convinced that west coast was calling him (although he thought Santa Cruz was a little too small-town). 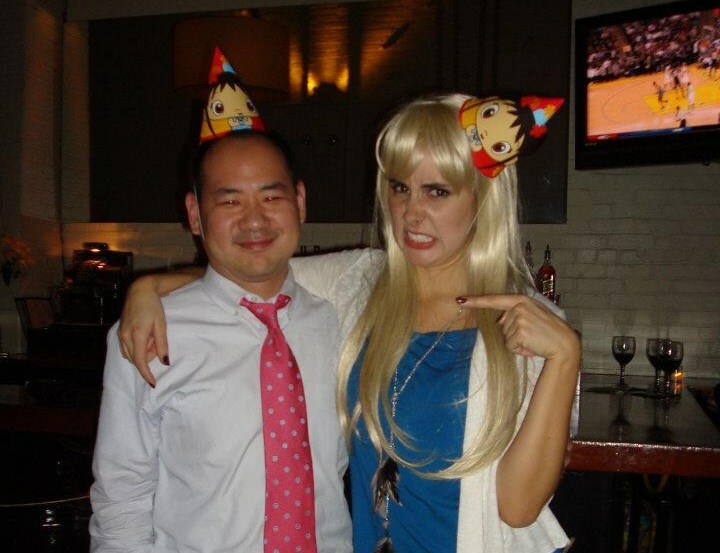 By that time, our hypothetical baby had a menu and a name (which will be revealed in time). Some serious discussions were held, promises made, schedules set, and then Arthur took a leap of faith and quit his job. Now that the bar exam and Burning Man are over, we diving into this project head first. 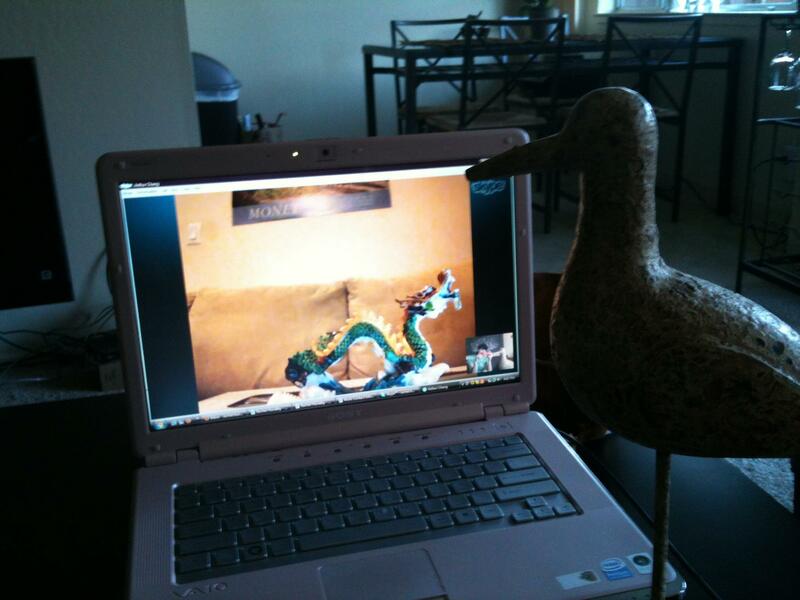 It will be a month and a half more of Skype meetings, and then Arthur’s going to make his own big move, first to San Francisco and then to Santa Cruz. I’ll save the details for future posts, but we are very excited about the business and what the future holds. I’m also excited about this new partnership. I don’t know anyone more trustworthy and dedicated than Arthur, and I think that the two of us together have an unstoppable skill set. Let’s all give a big welcome to Arthur…. you’ll be seeing a lot of him from now on. 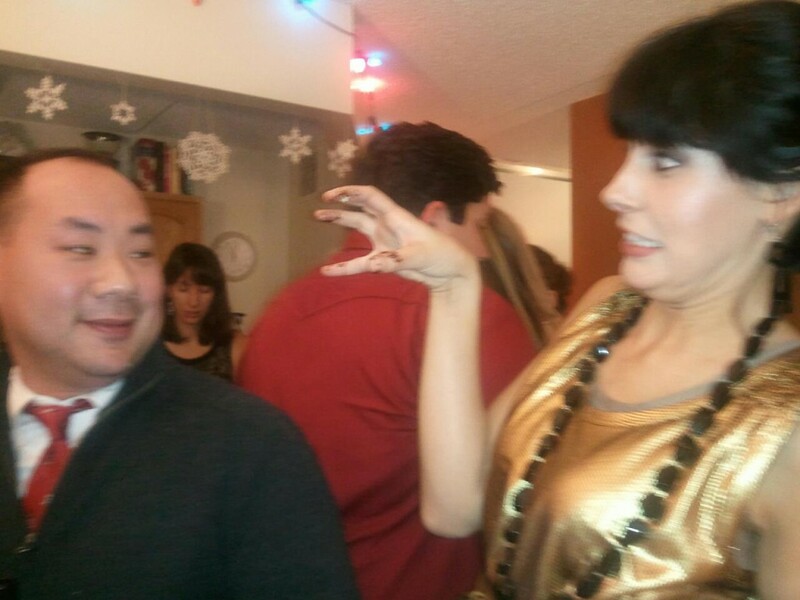 I am going to deviate from the true intention of this blog for one more post. I have a lot of friends on the east coast who don’t know much (if anything) about Burning Man, so here are a few photos and a weak attempt at sharing my own experience. 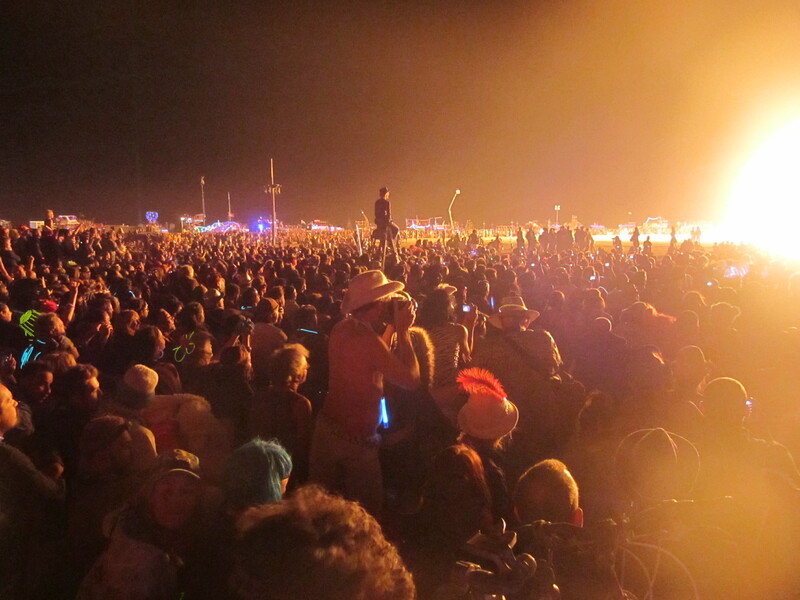 It is hard to describe exactly what Burning Man is, but I can tell you it isn’t as scary as you probably think it is. Going into the week, I was a little nervous about what I was getting myself into. The prevailing view among those who haven’t been is that it is a bunch of naked people doing a bunch of drugs in the desert. Although it is true that I encountered both, it was such an peripheral part of my experience that I find it hardly worth mentioning. Radical Inclusion – Anyone may be a part of Burning Man. We welcome and respect the stranger. No prerequisites exist for participation in our community. 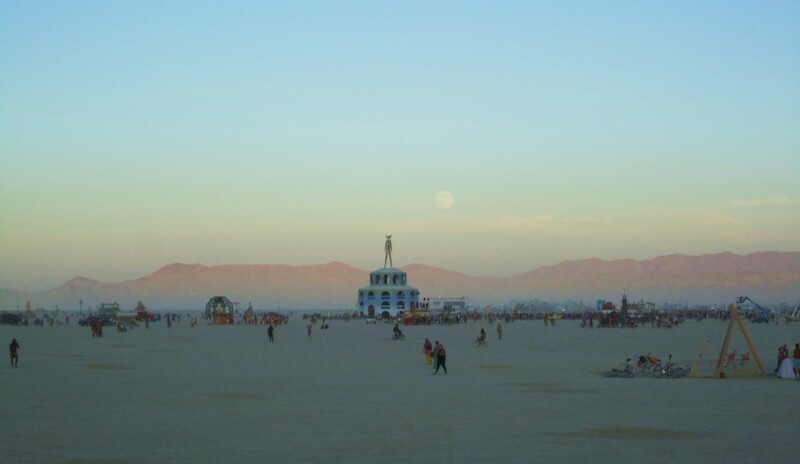 Gifting – Burning Man is devoted to acts of gift giving. The value of a gift is unconditional. Gifting does not contemplate a return or an exchange for something of equal value. Decommodification – In order to preserve the spirit of gifting, our community seeks to create social environments that are unmediated by commercial sponsorships, transactions, or advertising. We stand ready to protect our culture from such exploitation. We resist the substitution of consumption for participatory experience. 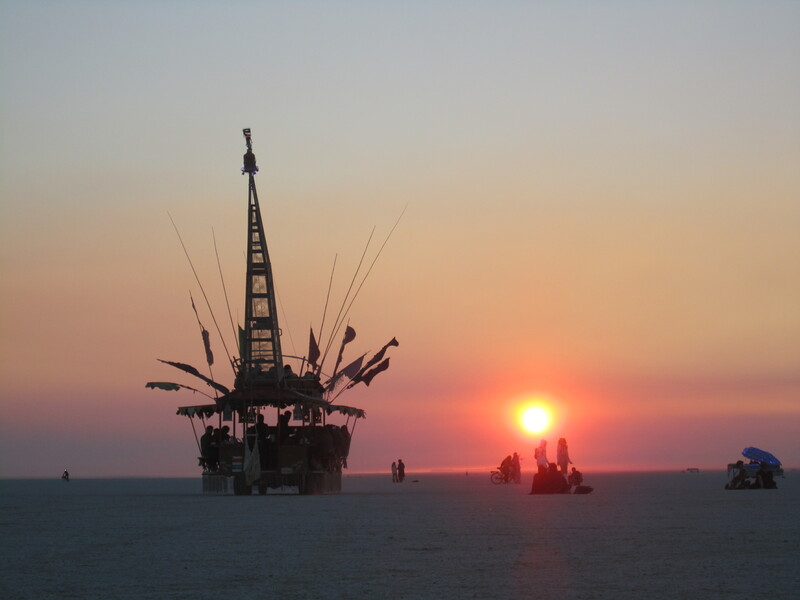 Radical Self-reliance – Burning Man encourages the individual to discover, exercise and rely on his or her inner resources. Radical Self-expression – Radical self-expression arises from the unique gifts of the individual. No one other than the individual or a collaborating group can determine its content. It is offered as a gift to others. In this spirit, the giver should respect the rights and liberties of the recipient. Communal Effort – Our community values creative cooperation and collaboration. We strive to produce, promote and protect social networks, public spaces, works of art, and methods of communication that support such interaction. Civic Responsibility – We value civil society. Community members who organize events should assume responsibility for public welfare and endeavor to communicate civic responsibilities to participants. They must also assume responsibility for conducting events in accordance with local, state and federal laws. Leaving No Trace – Our community respects the environment. We are committed to leaving no physical trace of our activities wherever we gather. We clean up after ourselves and endeavor, whenever possible, to leave such places in a better state than when we found them. 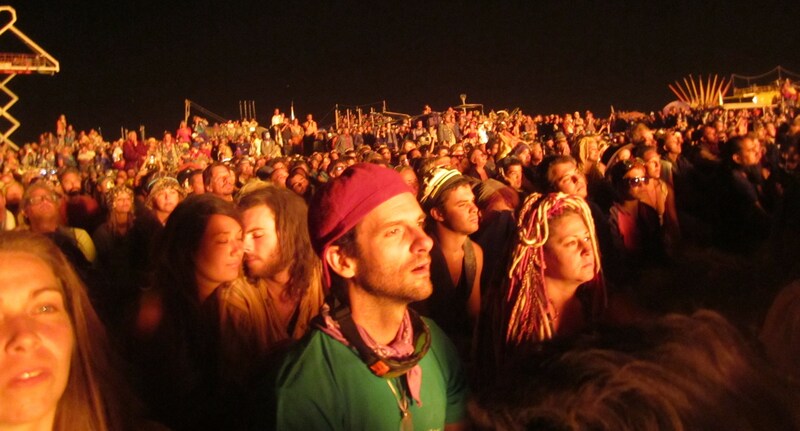 Participation – Our community is committed to a radically participatory ethic. We believe that transformative change, whether in the individual or in society, can occur only through the medium of deeply personal participation. We achieve being through doing. Everyone is invited to work. Everyone is invited to play. We make the world real through actions that open the heart. Immediacy – Immediate experience is, in many ways, the most important touchstone of value in our culture. We seek to overcome barriers that stand between us and a recognition of our inner selves, the reality of those around us, participation in society, and contact with a natural world exceeding human powers. No idea can substitute for this experience. 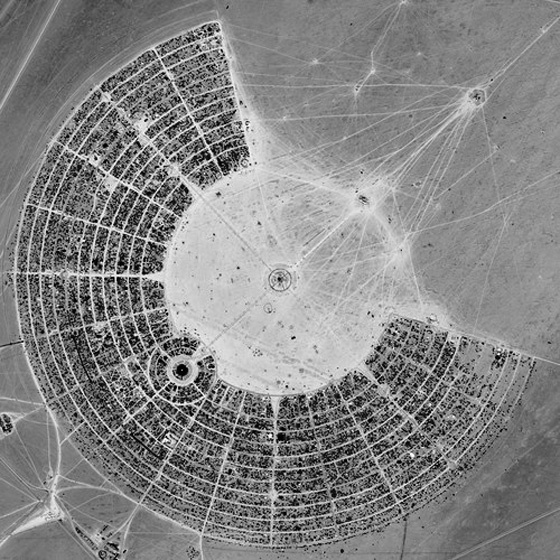 In the center of the circle is a large structure with a “man” on top that is burned at the end of the week. You’ll see what I mean in the photos below. The road lining the camps closest to the Man is called the “Esplanade” and features some of the more developed camps. I was fortunate enough to be a part of one of those camps. In the center of the city, in the space between the camps and the Man, there are dozens of other very large art installations. 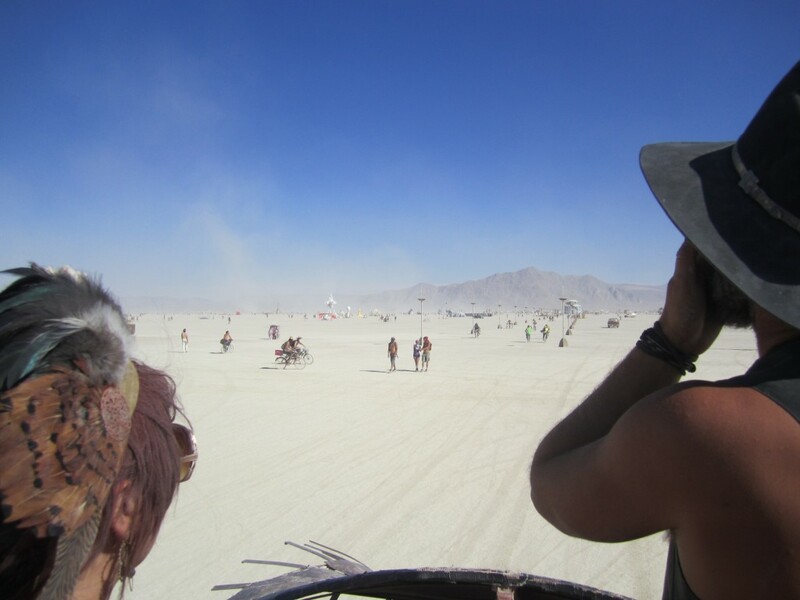 Driving throughout the streets of the city and the empty spaces around the sculptures on the playa are elaborately decorated “art cars” (although many were built out of RVs, trucks and buses) shaped like giant warthogs or fish or toilets or ships or even octopuses with flames shooting out of the legs. 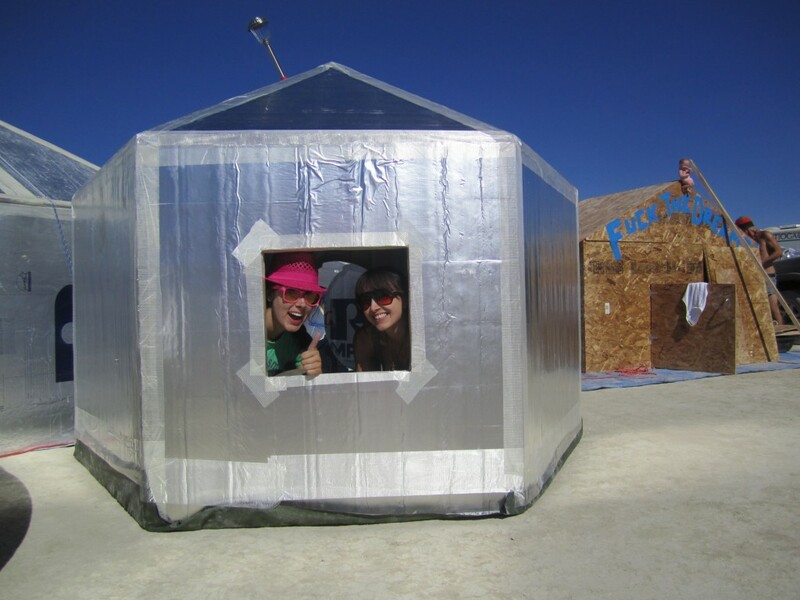 Since we were in the middle of the desert, the elements were pretty harsh at times, and my friend Davina and I built a 6′ hexayurt out of rigid insulation board to keep us cool during the day and warm at night. Although it was a little small for the two of us, it worked beautifully. 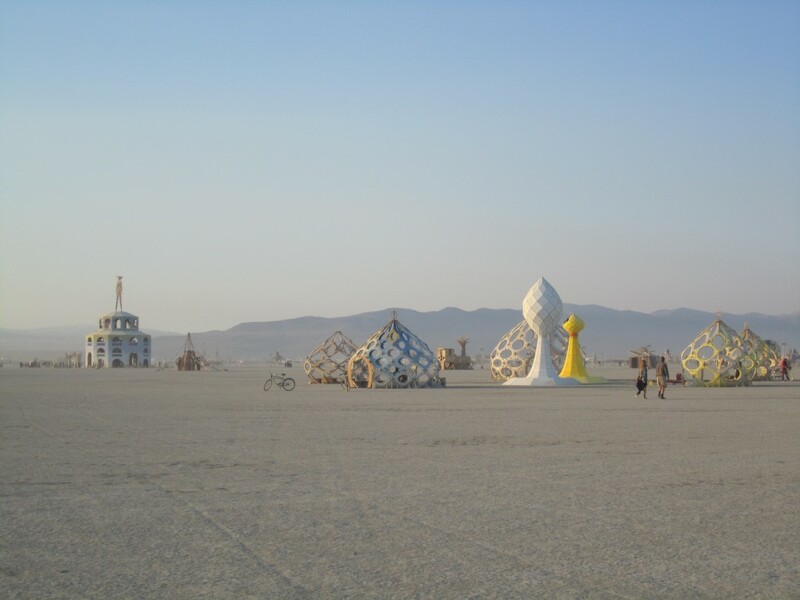 Once you have your housing situation set up, you have nothing on your agenda except exploring Black Rock City and accepting whatever adventures come your way. My absolute favorite time of day was between 6pm and 8pm because the sun would make its slow decent behind the mountains and for about two hours the temperature would be perfect. Sadly, I don’t have any photos of nighttime to share with you. Black Rock City is fascinating to see during the day, but at night it is mind blowing. The elaborate lights of the theme camps and the art cars are a little reminiscent of Las Vegas… if Dr. Seuss had been the city planner and chief architect. My week at Burning Man was a little unusual because a big focus of it was the wedding of two friends, Liz and Eric. They commissioned a sculpture made out of large panels of painted glass (pictured below) and were married in front of it… by a pirate. No, really. I have to pause for a moment and tell you about this wedding. Although I was camping with a larger theme camp, my sub-camp was the entire wedding party, and included both sets of parents, as well as a number of aunts, uncles, and siblings. 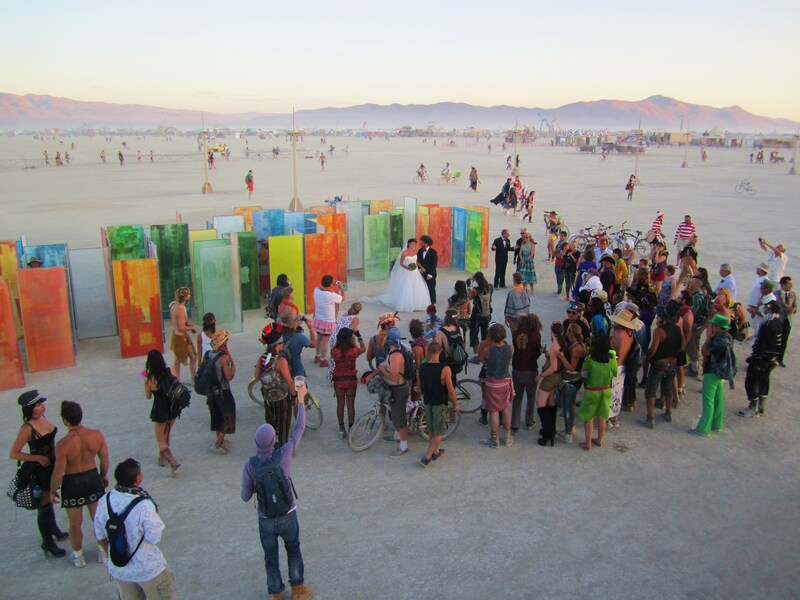 On the evening of the wedding, the wedding guests were picked up in an art car called the Black Light Lounge and were driven out to Liz and Eric’s wedding sculpture where the bride, groom, and family were waiting. We gathered around them, and all of the sudden a small art car shaped like a boat drove up and a pirate stepped out. The pirate greeted Liz and Eric, and Liz told the pirate that she and Eric were supposed to get married but their officiant was not present (which was kind of true because they had been assigned an officiant by Burning Man but decided it wasn’t a good fit). The pirate told them not to fear because he could marry them, at which point he pulled out a scroll, opened it, and performed a beautiful ceremony. At the end, after Liz and Eric exchanged very sincere vows, they stepped over the pirates sword and were officially wed.
Liz tossed her bouquet, and we all boarded the Black Light Lounge, which took us back to our camp where a champagne reception was waiting. We were then ushered back to our sub-camp where we had a cocktails, passed hors d’oeuvres, and a gourmet dinner (keep in mind we are still in the desert). Several members of the newlyweds’ families gave speeches, and then we all boarded the Black Light Lounge once again (only now it was stocked with a full open bar) and cruised the Playa until the sun rose. 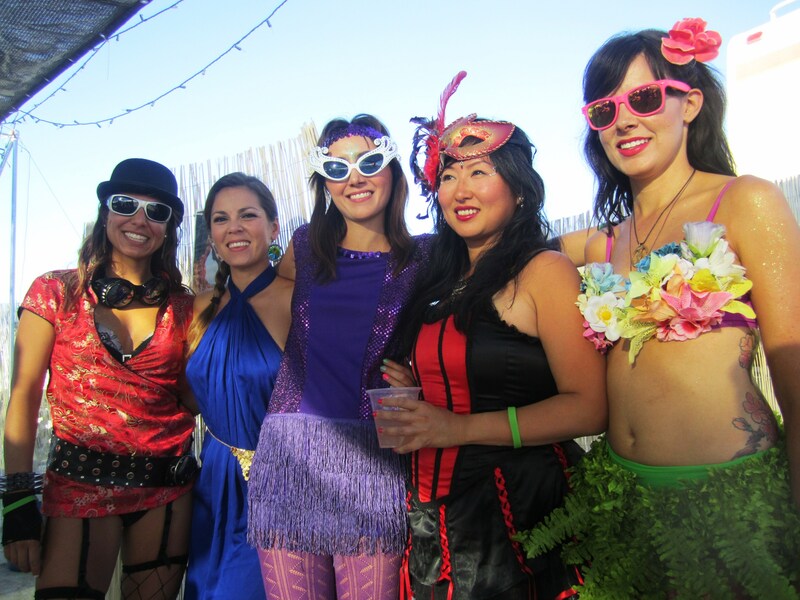 A small group of dedicated wedding guests — myself included — gathered at the “Bubbles and Bass” party next door (held every morning from 6am until noon) before finally going to bed. It was definitely a wedding to remember. 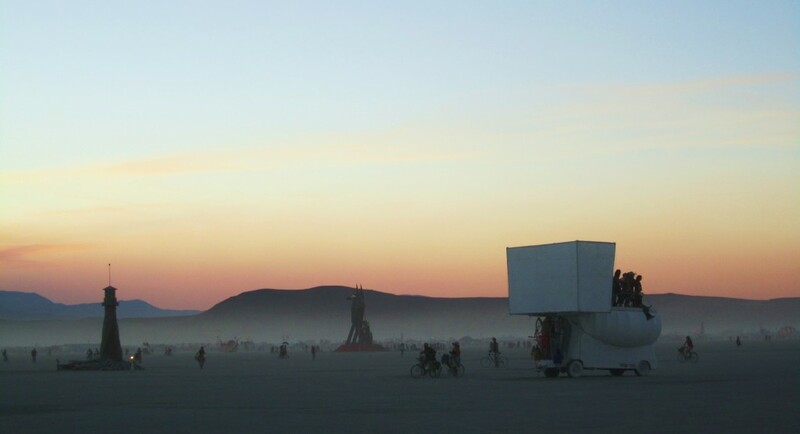 Watching the sun rise became a regular part of my daily events, and my favorite place to do so was with a collection of DJs with their own mobile sound system called Robot Heart. 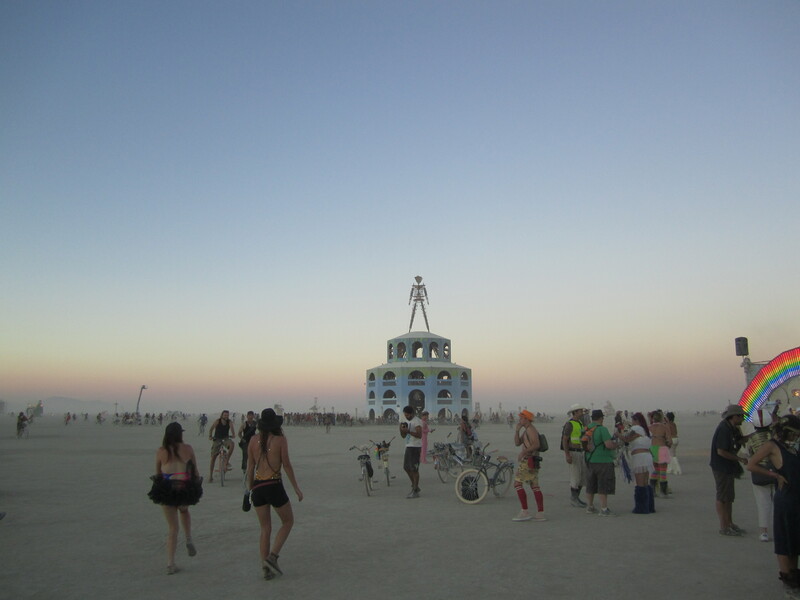 There were so many things that made my first week at Burning Man very special and life changing, and one of them was the people I camped with. Just about everyone at Burning Man is extremely friendly and open to the people around them. It made it so easy to meet new, interesting people throughout the week. The people I camped with were no exception. They were all so intelligent and multidimensional and were always fun to be around. I have no doubt I am going to keep in touch with many of them for years to come. I will end with briefly mentioning the burns. 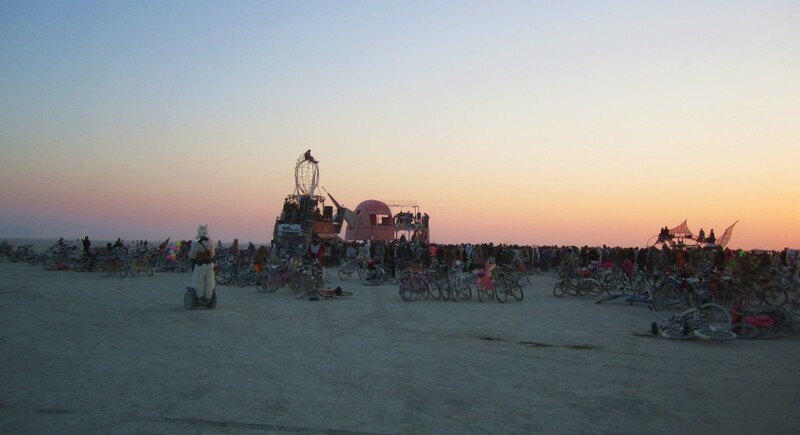 Burning Man started in 1986 when a small group of people got together and burned a n 8′ tall wooden man. 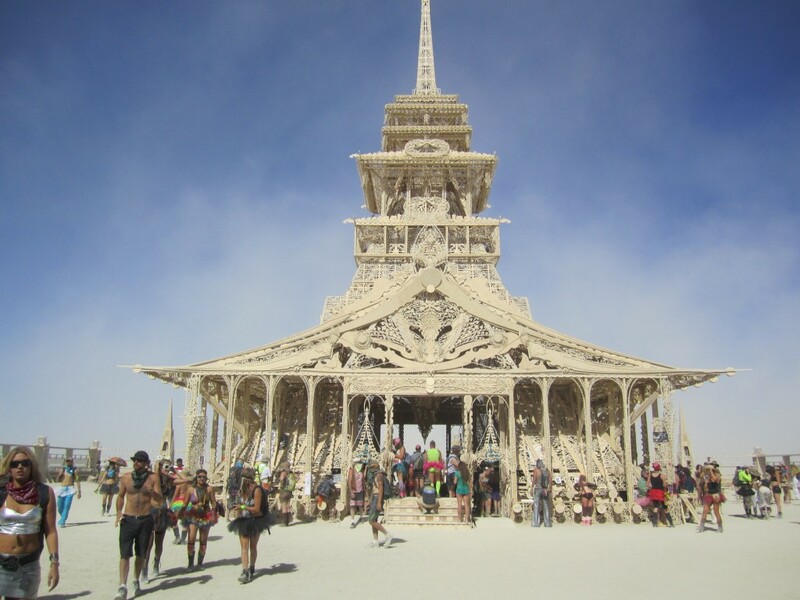 The exact reasons why they decided to do this are unclear, but the tradition has grown every year, and now a number of other wooden sculptures are burned as well. Burning something can be symbolic in a number of ways, and each of the burns I witnessed was very different from the others. 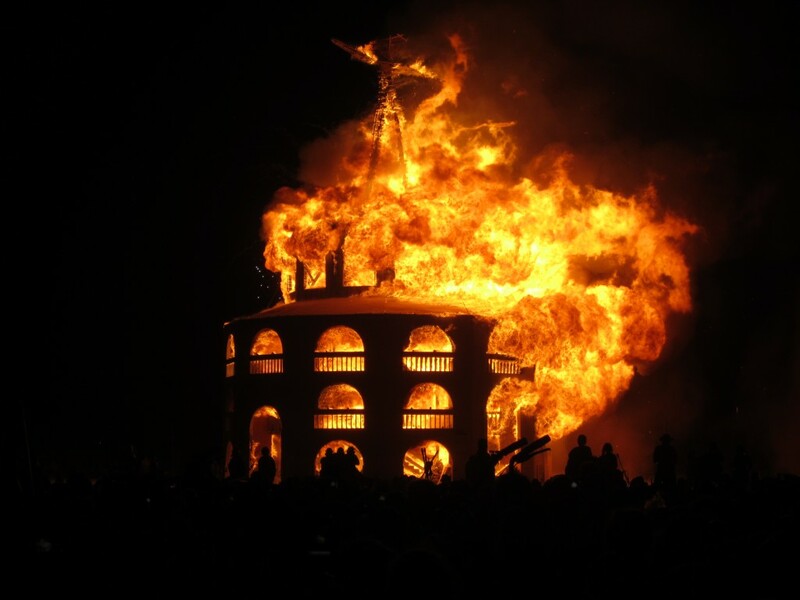 The burning of the Man is the peak of the week, and it is marked by a lot of celebrating. 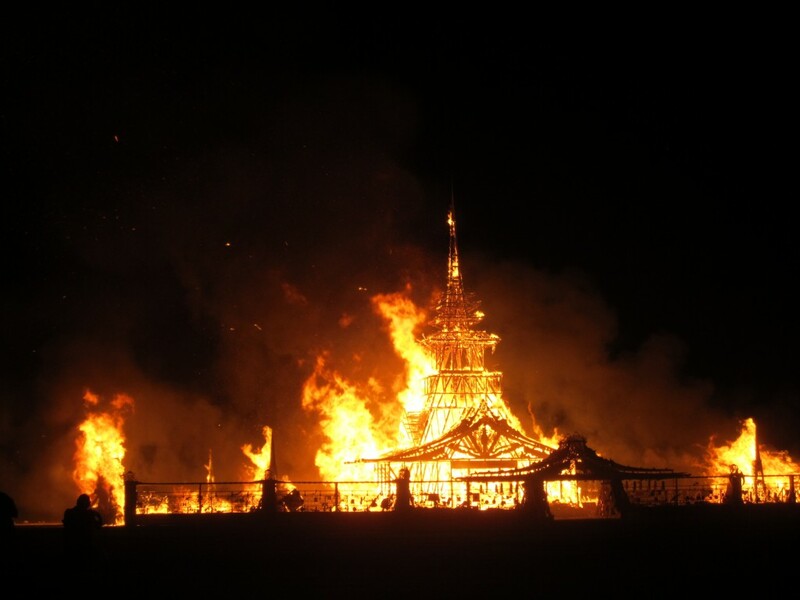 The temple burn, on the other hand, which usually happens the next day, is a very solemn and reflective event. 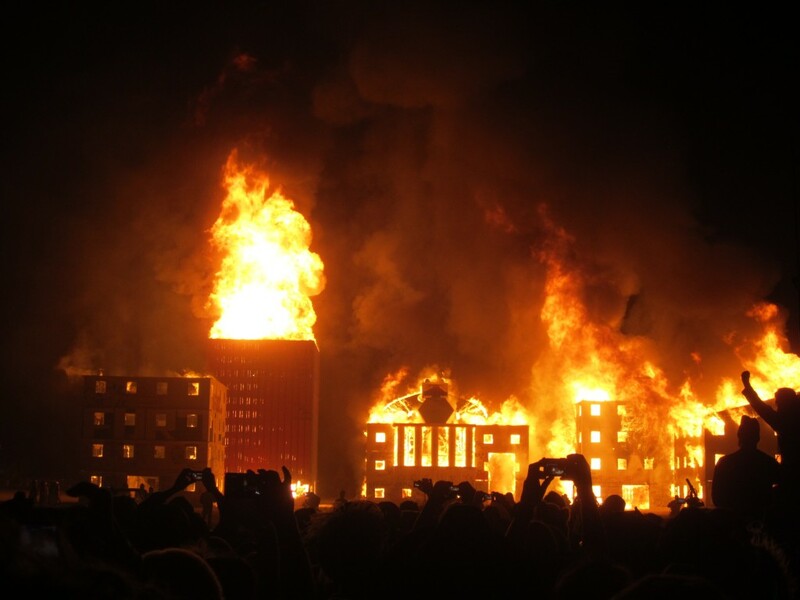 I also watched the burning of two independent art projects, one of which was called Burn Wall Street. The sculptures were large buildings modeled after some of the large banks and the New York Stock Exchange. 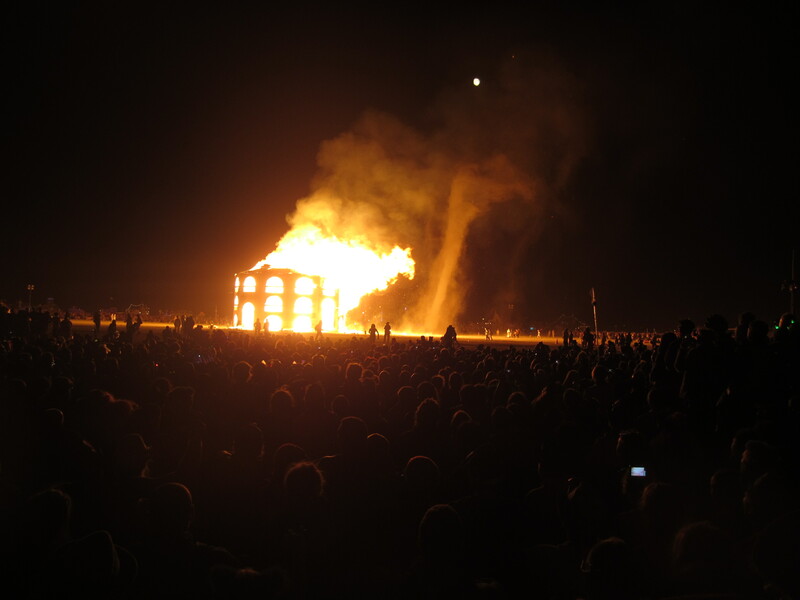 The buildings were open during the week for an assortment of activities, and then on Saturday night at 1am they burned them down. I have a video of some of the burn posted on YouTube: Burn Wall Street. I thought each burn was interesting for different reasons. For all of them, the 7th grade pyromaniac inside of me was filled with glee. 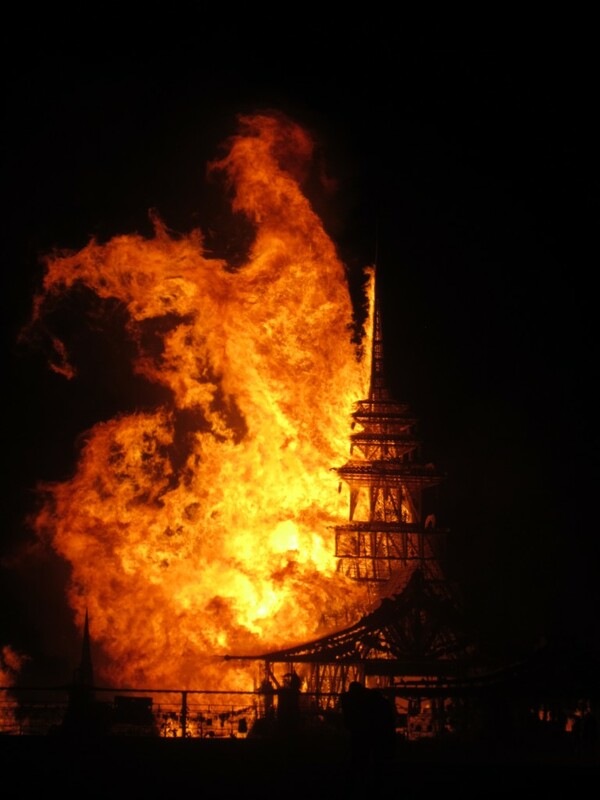 A phoenix rising from the burning of the temple?? 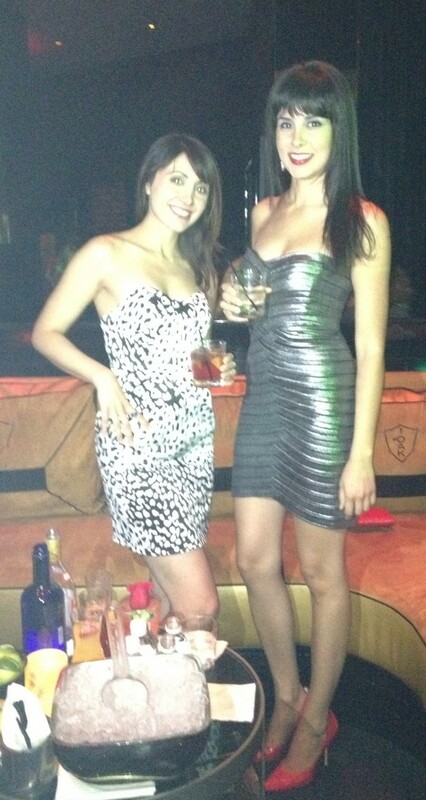 I’m hesitant to write anything about the week because I know I can’t do it justice. 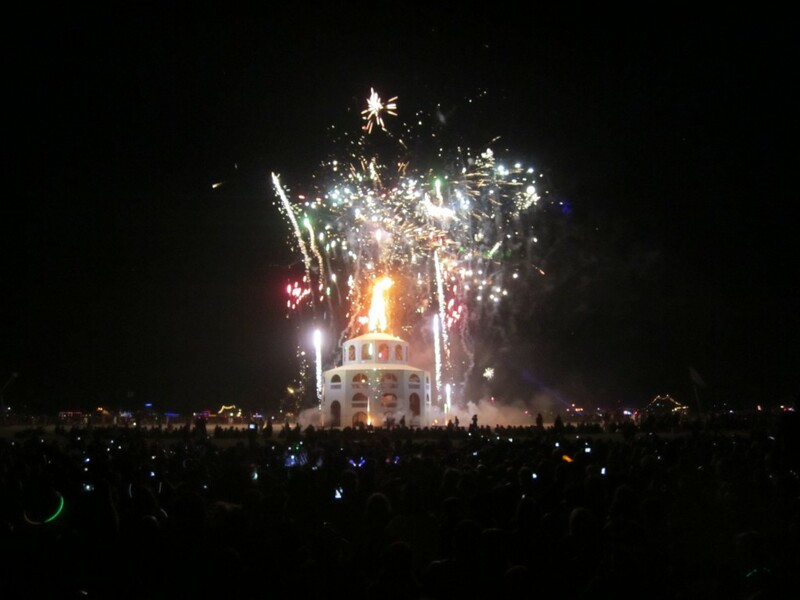 My first time at Burning Man was incredible. A lot of people call it “home” because of the complete freedom and acceptance it provides and the community that is built on those and other shared values. There was a moment after the Man burned when I walked toward the fallen, burning sculpture and was approached by a random person who handed me a handmade metal Man, gave me a hug, looked me in the eyes, and said “Welcome Home.” It was the first time someone had said it to me since my arrival, and suddenly I understood what it meant. I will definitely be returning next year. I tried to warn you about my busy summer. Were it not for all of the photos on my phone, I wouldn’t believe the past two months actually happened. Here’s a brief recap of what I’ve been up to, and then we can get back to business. 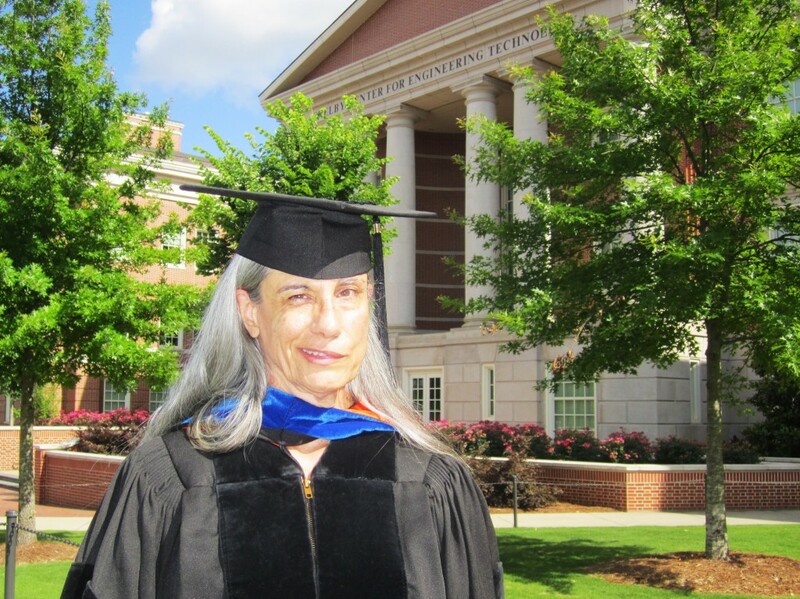 I saw my mom graduate with a PhD in Computer Science (yay mom!). 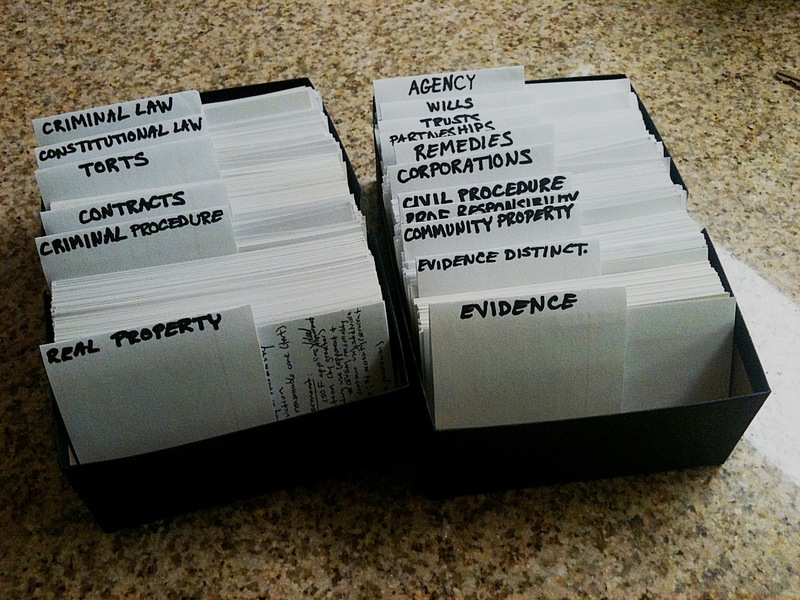 I studied for the California bar exam. Not fun at all. 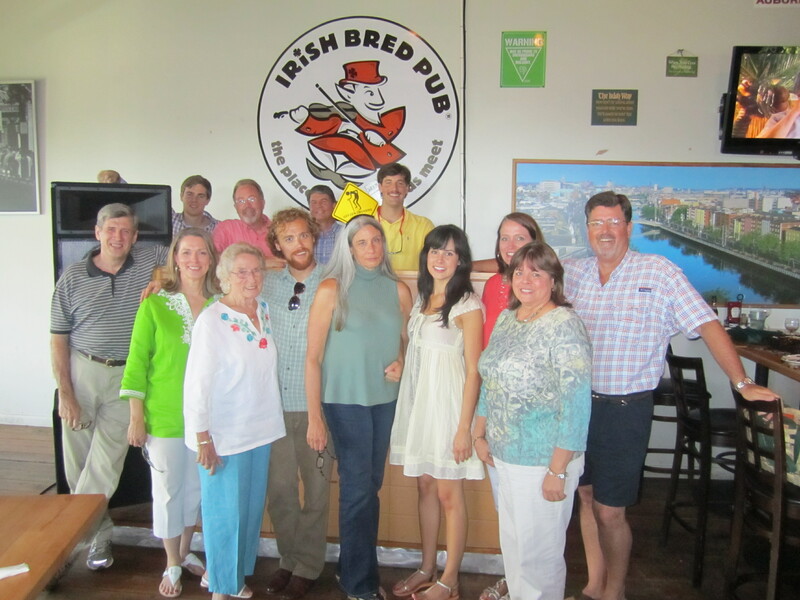 I celebrated my mom’s 60th birthday with family and friends in Alabama — she’s had an eventful summer too. 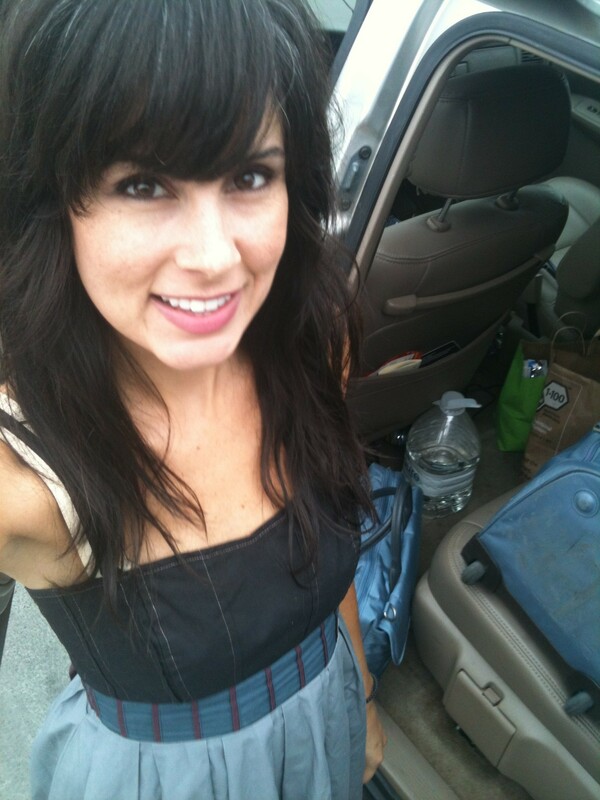 I took the California bar exam… and wore the same dress I bought for the New York exam for the third and last day. I feel pretty good about the exam, but the results don’t come out until November. 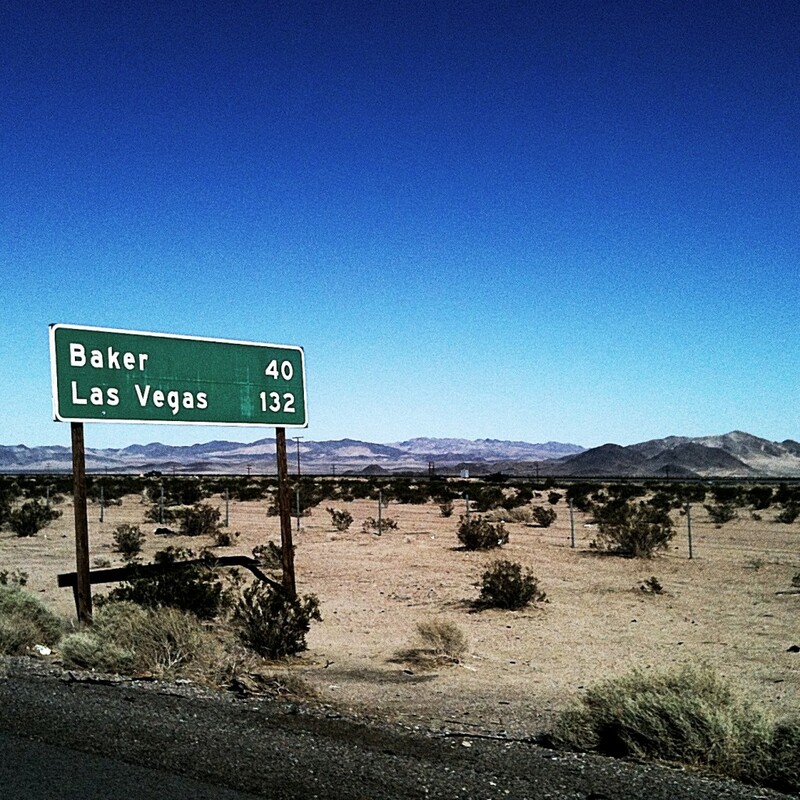 I embarked on a celebratory road trip. I visited L.A. for the first time… and liked it more than I thought I would. 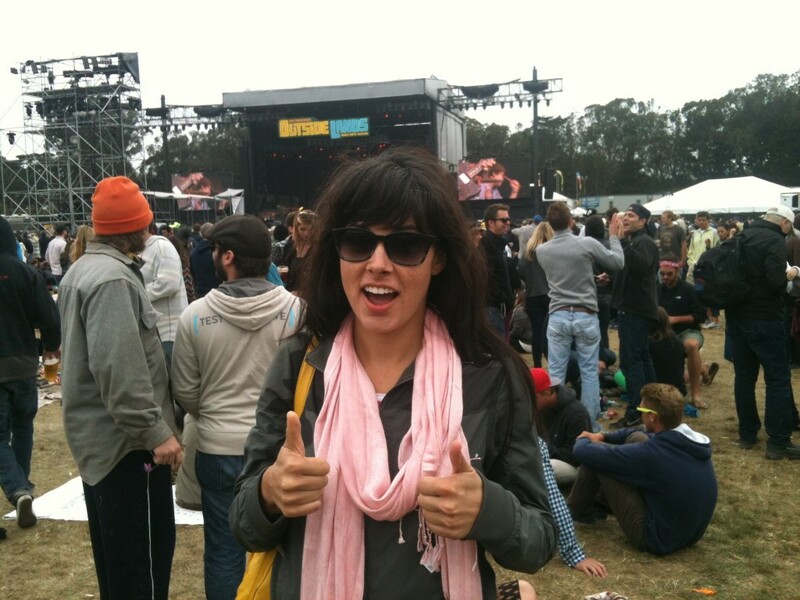 I went to Outside Lands Music and Arts Festival in San Francisco (here I am at Explosions in the Sky!!!). I celebrated my three-year anniversary with Steve in Napa (thank you Valerie for this awesome shot!). 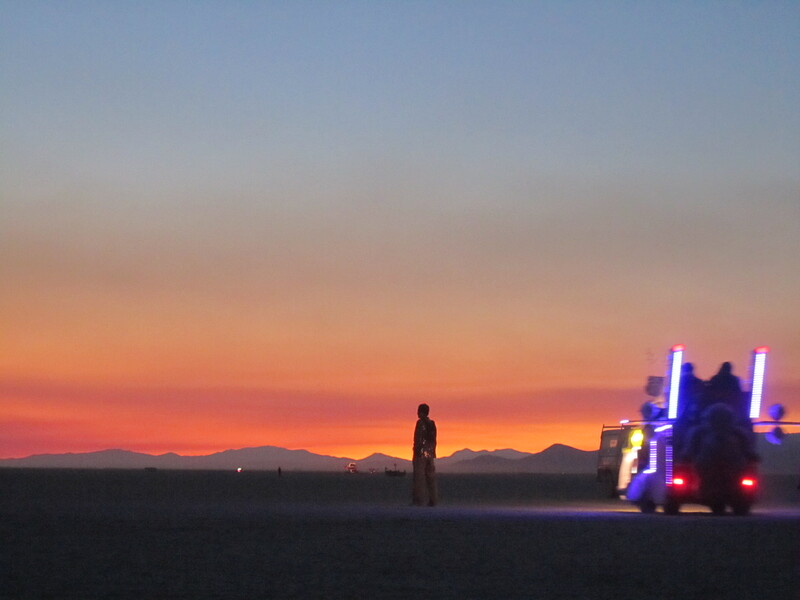 And I went to Burning Man. Anyway, that’s that. The Summer of ’12 has been one for the history books. Now it is time for business. Stay tuned.